In the past 22 months I have learned some very powerful and practical lessons in life and ministry. I think the one that should have the highest priority in my life and perhaps your as well is to guard your heart. From the heart the mouth speaks, minds conceive, and hands do. We must be ever so mindful to guard our hearts and minds in Christ Jesus testing our motives. Psalm 24 asks us a critical question, Who can ascend the holy hill of God? This Psalm does not leave us guessing it gives us a clear and concise answer, “Those who have clean hands and pure hearts.” Guarding our hearts is easier said than done because it requires honesty, brutal honesty! It requires us to deal with our deepest, darkest pain and it requires us to take a long hard and sometimes painful look in the mirror. I know full well and am fully convinced that City on a Hill Church would not and could not be as successful as we have been if I did not and if I do not guard my heart. The question to us and the question you are probably asking yourself is how? I’m glad you asked! Let’s look at scripture. Philippians 4:6-8 (NIV1984) 6 Do not be anxious about anything, but in everything, by prayer and petition, with thanksgiving, present your requests to God. 7 And the peace of God, which transcends all understanding, will guard your hearts and your minds in Christ Jesus. Here we see the answer to guarding our hearts. Prayer. Praying even when we don’t feel anything. Praying when everything is just awesome! Praying when you feel like your living in the middle of God’s favor and praying when you feel like Jonah in the belly of the whale. Thanksgiving. Giving thanks to God for what He has done in our lives. Taking a quick look around and a quick look back to see where God has brought us will keep our hearts guarded against the enemy of our soul. Guarding our hearts means reminding ourselves of the goodness and the greatness of our God even when we can’t see it. Guarding our hearts means that we do not question is God’s heart is good toward us. Guarding our hearts means not allowing any distrust is sneak in as if God were keeping something from us instead we see all that God has given us. Guarding our hearts means looking a the bible as a book of promises and freedoms not a book of laws and restrictions. Guarding our hearts means giving others the benefit of the doubt. Guarding our hearts means recognizing God is good and He expects us to be good because we are made in His image. Here is what I am also convinced of, if we do not guard our hearts they will become hard and calloused toward God and man. We will end up taking ten steps backwards. We will be further and further away from God’s will for our lives. Then rather than a time of refreshing and renewal we will also need a season of repentance before we can walk into God’s plan for our lives. My question is, Why delay? Why not guard our hearts and minds in Christ Jesus? Why don’t we just trust God to bring about His purposes and leave people to God? We can trust God is His justice. Please don’t look for life to be fair because it never has been and never will be! God is just and His purposes can not be thwarted (Job 42:2) So I encourage you my friends guard your hearts. If you’re going to get mad at something get mad at evil, satan, and sin. Take out your aggression on the enemy of your soul, strike hard into the heart of darkness. However, keep this in mind. We can not strike into the heart of darkness and not expect to pay a price. So guard your hearts. I want to leave you with a few scriptures to encourage you and to act as a warning sign or lighthouse concerning guarding our hearts. One last caution don’t think it can’t happen to you, because it can. To be forewarned is to be forearmed. 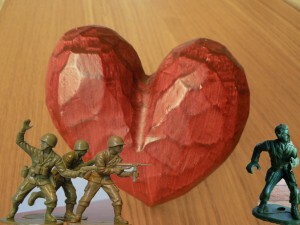 Soloman’s heart was turned away. 1 Kings 11:4 (ESV) For when Solomon was old his wives turned away his heart after other gods, and his heart was not wholly true to the LORD his God, as was the heart of David his father. Blessings rest upon those whose hearts stay soft toward God. Proverbs 28:14 (ESV) Blessed is the one who fears the LORD always, but whoever hardens his heart will fall into calamity. Our hearts are the wellspring of life. What has God put in your heart to accomplish? What is God asking you to do? Guarding our hearts is critical to the accomplishing of our divine purpose. Keep your hearts soft. Don’t give anyone the power to harden your heart. Don’t allow any circumstance to harden your heart even if it seems unrighteous. What would be worse is if the unrighteousness continues and renders us ineffective in the process. Guard your hearts and minds in Christ Jesus. We live our lives before the face of God. We live our lives for an audience of One! Don’t let anyone steal that from you and don’t let anyone tell you anything different. Be encouraged!